Hamilton’s waterfront has evolved over the past decade and two wide, paved trails provide easy access for cyclists and roller bladers who want to check it out. 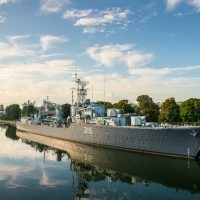 The Hamilton Waterfront Trail is a 7.5-km trail that follows the Hamilton Harbour from Cootes Paradise all the way to the site of the HMCS Haida, a historic Tribal-class destroyer that served in the Royal Canadian Navy. The Hamilton Beach Recreation Trail is an 8-km route from Burlington to Stoney Creek that features interpretative panels describing the history of Hamilton’s waterfront and how it’s been restored.